When the sun shines down in the City, there’s no reason your stay in Vancouver will be uninteresting. The city has so much to offer during the summer months June, July, and August from festivals, concerts to adventures and so much more. Canada day has always been the biggest celebration throughout the communities across the country. People get busy with numerous events during this time. In Vancouver, this year’s grand celebration is called as “Canada 150+” as 150+ events are themed to its 150 and more years of history. Special events in this huge celebration vary from sports, arts, festivals, to fireworks display and exhibitions. In honor of Canada’s 150th birthday, Parks Canada offers free admission to national historic places such as parks. Here comes the season to fill up your shopping bags with locally produced food and crafts. Markets from the different neighborhood are held on different days of the week. This season is the best time for locals and visitors to buy delicious and fresh produced fruits in the City. This year’s Indian Summer Festival showcases some of Canada’s golden artists as themed “Tales of War and Peace”. The 10-day festival highlights different events and performances from arts and culture to music and dance. Most of the events are happening at nights starting around 5 pm. The 10-day festivity of music, film, cuisine, virtual art, and literature, connects Vancouver to South Asian culture. Events are held at various venues in the City too. The celebration of light in Vancouver attracts the world’s finest firework designers and pyrotechnicians. It’s a one of a kind event to make memories while enjoying the festivals with families and friends. You better get ready to experience the mesmerizing sparks in the sky. This year, competitors from different countries will leave you unique fireworks display that will surely fill up your night. Summer isn’t complete without a visit to the diverse night markets in the city. All of them are close to downtown. Looking for exotic foods? Be sure to taste different foods from hundreds of vendors in stalls. More often, they offer a vast of Asian cuisine that would surely satisfy your cravings. Every summer these night markets are loaded with crowds. The four major summer night markets in Metro Vancouver are the Richmond Night Market, Panda Night Market, Shipyards Night Market and the Surrey Night Market. There are many stunning beaches to visit during summer in Vancouver. One of them is the Kitsilano beach or “Kits Beach” where there are lots of fun sports activities to enjoy. Kids can also splash onto the “Kits Pool”, an outdoor salt water pool with alluring ocean and mountain views in the city. If you’d like a less crowded beach, you can hop into the Spanish Banks beach. The Spanish Banks is also ideal for skimboarding. Also, it comprises three sections: the East, the West, and the Extension. Vancouver Park Board officially agreed on the bylaw amendment of banning cetaceans in Vancouver Aquarium. There will be no more rescued cetaceans in the future to be displayed in the Aquarium after the board’s decision last May 15, 2017. The bylaw was voted unanimously. Furthermore, the three cetaceans which currently live in the aquarium will stay but will be banned for performance. To restrict all cetaceans and setting date for compliance. Thus, removing three resident cetaceans out of Stanley Park. Although the decision has agreed, the aquarium will still investigate all alternatives to plunge the park commissioners’ “inhumane choice” according to aquarium CEO John Nightingale. He said that the ban will close down the program of captivating harmed cetaceans ending up euthanizing them as they can’t be kept and be brought to the aquarium. He believed that the bylaw isn’t about creature conservation but a system belief and politics instead. On the other hand, protesters against captivating cetaceans believed that the decision of the park board is right. They agreed that whales and dolphins should not be put in tanks alone to do tricks to people. And that they must be with their family and home which is not in the aquarium. The death of Qila and Aurora lead to the debate of captivating cetaceans in Vancouver Aquarium. Earlier before the bylaw officially announced the voting, the aquarium CEO John Nightingale said that the aquarium will fight til the end in order to preserve its Marine Mammal Rescue Program. Last November 2016, two sheltered Belugas in the aquarium died. The two animals are long time residents in the aquarium for about two decades. Qila was the first to develop symptoms of stomach cramping and loss of appetite. Despite specialists’ extra care from around the globe, Qila died on November 16th. And after few days, Qila’s mother Aurora, experience the same illness and died 9 days after. After five months of investigating possible cause, it was concluded that an unknown toxin killed the Belugas. After a month of deaths, the Aquarium took effect to preventing risks that could bring a toxin to their home. Currently, the aquarium houses three cetaceans. Daisy – a harbor porpoise, Helen – a white-sided dolphin and Chester – a false killer whale. The three are still allowed to remain at the aquarium but future whales, dolphins or porpoises in city parks are at “no exemptions”. And are prohibited to be part of the show. 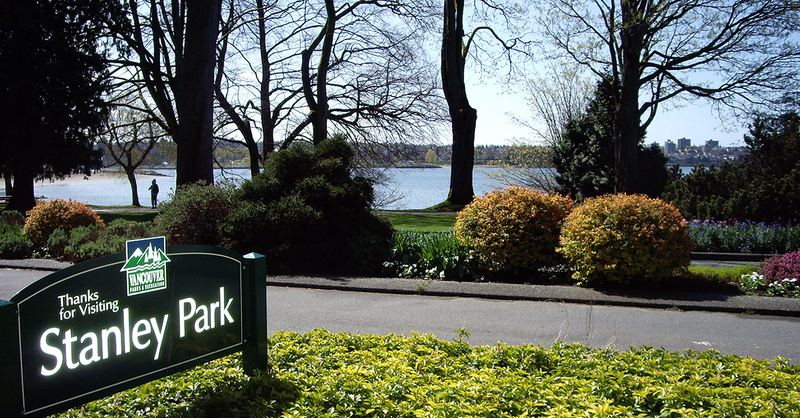 Stanley Park is the top visited parks in British Columbia. The urban park is named “the best park in the world” with an area of 405-hectare. The park is surrounded by abundant resources including beaches, lakes and many recreational areas where you can hop into its beautiful nature. Stanley park is full of fun family activities. Get ready to discover some of the historical places, great restaurants, some of the nearest hotels and scenic beaches & lakes in Stanley Park. Situated near the entrance of Stanley Park, right in the middle of the lagoon, you can find the large lighted fountain (Jubilee Fountain). Get to see wonderful species of birds and swans as you enter the lagoon. Located at Second Beach south side of Stanley Park, the large swimming pool is a perfect outdoor pool for you. The pool will be open in the whole summer, a perfect place to take your family to. You would surely be inspired when you get to see closer the wonderful sea creatures at the Vancouver Aquarium. This public aquarium is great for a family visit. They have over 50,000 animals showcasing local and aquatic life. Stanley Park offers a collection of totem poles. Upon entering the park, you can see nine different collections of totem poles. The breathtaking view of this restaurant is ideal for corporate events and celebrations. Their exquisite cuisine not just offers delicious menus but also serve a complete west coast experience. is a great stop at the park. Enjoy the overlooking views with a glass of wine in the lovely atmosphere with a great service. Overlooking the Sea Lions Gate, this bar and grill offer 200 indoor/outdoor seat serving casual, fun and friendly menu. You will love the atmosphere as you watch cruise ships sailing by as you dine. This hotel is just walking distance from Stanley Park Seawall. In here you will have a choice to choose your comfortable suite that fits your needs and lifestyle. They have spacious rooms with fully equipped kitchens ideal for extended stays, weddings and other events. This condo hotel is located in the heart of Vancouver adjacent to Stanley park. Enjoy fantastic views of the park while you stay. The place is close local transport links too. If you are looking for the best hotel service, this hotel is your place to stay. They are known for best customer service and well-equipped room. And they are walking distance from local restaurants, boutiques and galleries. Planning to take a trip to Stanley park? Well, you would probably have the most unforgettable experience then. Discover the real beauty of nature and start your vacation with a great ambiance of different landmarks to satisfy every adventure. If you are looking for a perfect place to be in the summer, Richmond Night Market is a complete destination for you. Located in 8351, River Rd, Richmond, BC V6X 1Y4, Canada, just minutes from Bridgeport Canada Line Station. The place is known to be the largest and the biggest Night Market in North America. It has become one of the Lower Mainland’s tourist destination during summer. With over 140 food stalls and 400 retail vendors, allow yourself to enjoy different mouthwatering food along with the barbecued meat and seafood on a skewer, spiral potatoes on a skewer, squid, deep fried octopus balls, hand-pulled ramen, grilled beef and pork jerky, vegetarian tempura, battered fish, and desserts like the taro flavoured egglet parfait, milkshakes, cakes, ice canes, and a whole lot more . You would probably get satisfied with so many food choices in the place. You got to be sure not to eat before heading to the market! Spend less with a great product at the Night Market. From cell phone accessories, jewelry, apparels, designed socks to hand-crafted accessories & bags, Richmond Night Market has you covered. Satisfy your visit not only with food but with nightly entertainment as well, including martial arts, dancing, and singing. Kids will probably enjoy the Giant Kid’s Zone where they can play in the inflatable fun featuring the Magical Smiley Castle. They can also meet and take selfies with baby dinosaurs, happy face characters, the Talking Tree and the Playful Fountains. 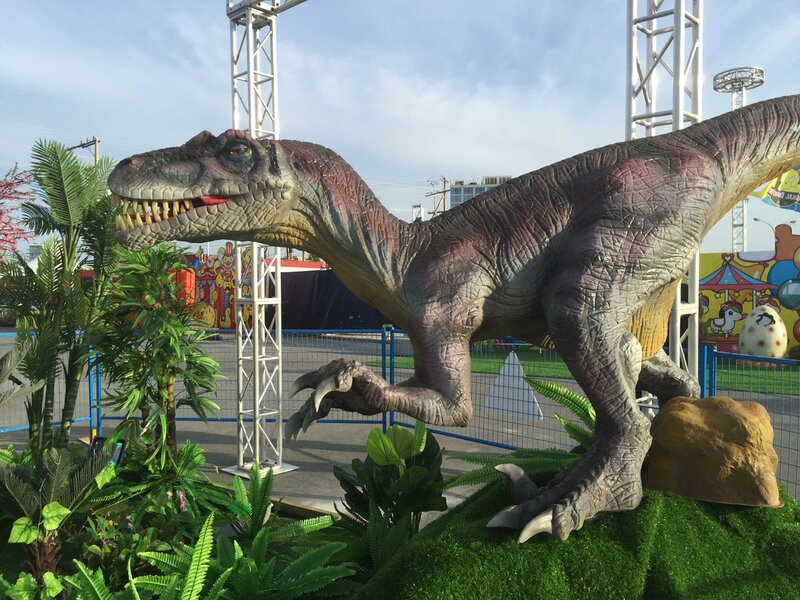 Take your family on a prehistoric adventure in the Market’s Magical Dino Park, the home to 18 dinosaurs that can move and roar featuring species of Brachiosaurus, Dilophosaurus, Pterosaurs, Stegosaurus, Tyrannosaurus Rex, Velociraptor, and Triceratops. Take a chance to meet Rex (the Mascot Dinosaur that roars) with his friends and take a ride with the friendly dinosaurs. The new expanded game area is intended for people who want to play challenging games. They have carnival games where you can try your luck and win yourself. Thrilling midway rides includes Ferris Wheel, helicopters, Octopus, and others. You may also take a walk into the water without getting wet with the popular water walker. Take pleasure in the night market’s sweet Dino Deals, Dino Bites, and Dino Discounts with the market’s coupon book which can also be used in local stores and restaurants. Delight your tour with over $250 discount at over 60 retail stores and over 35 food booths including deals at the carnival games. The $20 Zoom Pass is your express access that is fast (where you can skip the line for entry), easy and even transferable (good for visiting family and friends). It is good for up to 7 visits. Get Zoom Pass at Richmond Night Market’s front gate, or at the main office #3063 – 8700 McKim Way, near Cambie and Garden City roads in Richmond. Parking spots available is over 2500. Canada line or transit is recommended for visitors who plan to visit after opening time, as it is the best way to get into the location. *Admission fee is $3.25/person. Free admission for children 10 years old and below, seniors 60 years old and above with ID.